The pace dipped last year but has stayed high even as oil and gas companies, using advanced hydraulic fracturing techniques, pushed into more densely populated areas and fought to keep their exemption from regulations designed to prevent explosions at industrial sites. Industry leaders say oil and gas well sites don't have a problem with fires and explosions. "There is little performance data showing there is a safety problem at these facilities," the American Petroleum Institute, the industry's biggest lobbying group, wrote earlier this year in a filing with the Occupational Safety and Health Administration. "The risk level is not high." Brandie Hanley, however, thinks the risk level is high. In 2012, an oil well exploded in her rural northwest Ohio neighborhood. The blast killed a 19-year-old worker, Paul Sherman, and hurled an oil storage tank more than 250 feet. If it had been launched in a different direction, she said, it could have hit her duplex, or a nearby group home for disabled adults. "Nobody would have made it out of there," Hanley said. Adding to her worries, the owners drilled a new well a week later, just a little farther away. "There should be yards or miles between people and those things, but they're right in people's backyards," she said. "You shouldn't have to be afraid to live where you live." Ohio allows wells to be drilled as close as 100 feet from homes. OSHA accident investigations show that explosions at well sites can hurl heavy steel tanks twice that far. Other states ban wells within 500 feet of homes, while some have no rules on how close a well can be. But even 500 feet might not be safe. A 2012 explosion at a compressor station in Colorado launched metal parts more than 750 feet. "If you look at the zoning requirements, they aren't very strict," said Vidisha Parasram, who led a U.S. Chemical Safety Board investigation into storage tank explosions. "It's literally a patchwork across the country." 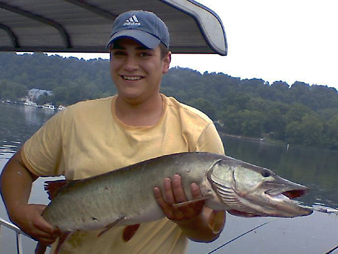 Greg Bish took a job at West Penn Energy Services in September 2010 to be closer to home and his favorite fishing spots. He was killed in an explosion on Dec. 9, 2010. Photo courtesy of the Bish family. That CSB study found 26 explosions and fires since 1983 at conventional oil and gas sites that killed 44 members of the public and injured 25 others. Often, they were young people "hanging out" at tank sites. The board, fashioned after the National Transportation Safety Board, made six recommendations to government agencies and industry groups when it released the study in 2011. None has been implemented. Jeff Eshelman, spokesman for the Independent Petroleum Association of America, said the number of fatal fires and explosions is small and getting smaller. "Of the 4,405 workplace fatalities which occurred in the United States in 2013, 13 were associated with fire/explosions in E&P operations, that's down almost half from the prior year 2012 with 23 incidents," Eshelman said. "While this represents a very small percentage, it is certainly unacceptable, and industry safety is our No. 1 priority." Last year's 13 fire and explosion deaths, though, were more than for any other private industry. Oil and gas had 112 fatalities overall in 2013, down from 142 in 2012. 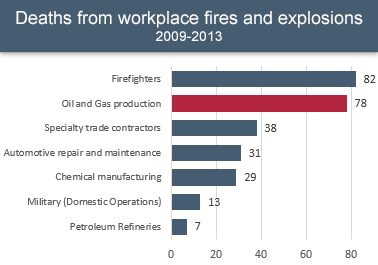 The only "industry" to have more fire and explosion fatalities than oil and gas in 2013 was firefighting, which had 42. That was a tenfold increase from 2012, driven by several disasters such as the Yarnell Hill wildfires in Arizona that claimed the lives of 19 firefighters. Eshelman said measures have been adopted throughout the industry to prevent fires and explosions, such as better design standards, gas detectors, strict control of potential ignition sources, rigid smoking restrictions and new firefighting equipment. But the thick files generated by OSHA investigations at fatal well explosions detail dangerous habits at well sites. The carelessness not only injured or killed workers but risked the safety of those living nearby. Two rig supervisors continued to drill at an AB Resources well site near Moundsville, W.Va., in 2010, even after the air filled with flammable methane gas. It then exploded, injuring seven men and melting the rig. The methane came from an abandoned coal mine the Union Drilling Inc. crew had already pierced once when drilling an adjacent well. They were using a process called "drilling on air" that is particularly dangerous when the drill bit hits oil or gas. After an explosion killed a company employee, the safety manager of Weatherford, Texas-based C&R Downhole Drilling told investigators she was new to the position and did not have any formal training in safety. Investigators believe the employee, Tommy Paxton, 45, and four other men were standing in a "flammable vapor cloud" at the Antero Resources site near West Union, W.Va., in 2013 when a spark triggered the explosion. Jason Means, 37, an employee of Nabors Completion and Production Services, was also killed and three others were injured. U.S. EPA in 1998 exempted oil and gas sites from Clean Air Act risk management regulations based on the belief that oil and gas coming out of the ground is "unlikely to form large vapor clouds." The rented blowout preventer used by Premium Well Drilling at a well near Carrizo Springs, Texas, in 2008 wasn't fully tested after it was installed, and the crew wasn't trained to use it. The blowout preventer also lacked a shear ram, which would have allowed it to close off the well bore when the crew hit a gas pocket and the well "kicked." The rig went up in flames and Jesus Beltran, 67, was killed. Two other workers suffered burns in the fire at the well, owned by Express Oil Co.
Contract workers killed in a 2011 explosion in Wyoming had no formal training or supervision before being sent to install a fuel line. One worker was welding on a gas line connected to a storage tank containing more than 1,300 gallons of crude oil at a Samson Resources Co. well site outside Casper. The explosion killed James Turner, 55, of Double D Welding and Fabrication, and Gerardo Alatorre and Llewellyn "Louie" Dort, 32, both of Wild West Construction. 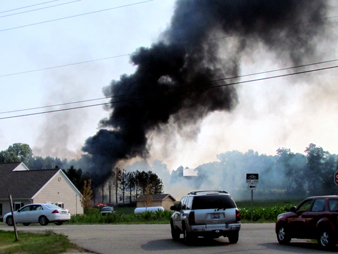 The blast also hurled two 4,000-gallon metal tanks more than 120 feet and caused a 10-acre fire. A battery-powered headlamp worn by a water truck driver appears to have been enough to set off the flammable hydrocarbons venting out of a "brine" wastewater tank at an EQT Production Co. well in February 2013 in Flemington, W.Va. The driver, 43-year-old Brian Hopkins, was working for Central Environmental Services Inc. (CES). He was blown off the catwalk and killed. The explosion tossed a two-story brine tank 100 feet. EQT's tests found no problems with the equipment, but OSHA cited CES for giving employees headlamps that were not "intrinsically safe" around flammable vapors. The drilling industry's safety record has become increasingly important as the nation's drilling boom pushes into densely populated areas that have less familiarity with drilling. An explosion at an oil well near Bolivar, Ohio, in 2012 killed a worker, hurled a tank more than 250 feet and alarmed neighbors. Photo by Brandie Hanley. The Wall Street Journal last year reported that at least 15.3 million Americans lived within a mile of a well that had been drilled since 2000. That is more people than live in Michigan or New York City. The new wells are not always welcomed by their neighbors. Drilling in the suburbs of Denver has prompted some cities to try to ban hydraulic fracturing, or fracking, an essential practice for producing from shale. Even some cities in oil-friendly Texas are weighing bans or sharp restrictions on drilling. A research paper from the Colorado School of Public Health earlier this year observed that accidents at well sites don't simply jeopardize workers but can also expose those who live nearby to fires, explosions and hazardous chemicals. "It's absolutely a concern," said John Adgate, chairman of the school's Department of Environmental and Occupational Health and co-author of the research review, which was funded in part by the National Science Foundation and the Department of Energy. "When you go out and talk to groups, that's what people want to know about," he said, "those kind of potential catastrophic risks." Oil and gas producers are currently fighting to keep their exemption from a set of rules intended to prevent industrial explosions. OSHA developed the "process safety management program" in the 1990s after a series of disasters at refineries and chemical plants. "PSM," as it's called, helped lower fatalities and generated more information to help prevent accidents. But OSHA officials agreed to leave out oil and gas. Instead, the agency said there should be a separate set of rules to fit the industry's "uniqueness." Shortly after that, presidential administrations changed and the initiative stalled (EnergyWire, Feb. 25). The April 2013 fertilizer plant explosion in West, Texas, which killed three residents and 12 first responders, prompted the Obama administration to take another look at the PSM rule. Among other ideas, the administration signaled interest in ending the exemption for drilling companies. Oil and gas companies are fighting the idea, saying the program is a poor fit for the fast-moving drilling business. Tests on sludge in the tank of the West Penn truck showed it contained "aliphatic hydrocarbons" -- chemical cousins of oil and gas that are prone to explode. Photo courtesy of OSHA. "Like prescribing painkillers for a paper cut" is how Rick Muncrief described it. Muncrief, senior vice president of operations and resource development for Continental Resources Inc., added in his letter to OSHA that it would likely cause a regulatory "overdose." The oil and gas industry brings a lot of horsepower to any such regulatory debate. It spent $145 million lobbying the federal government last year, according to OpenSecrets.org, more than any other industry except pharmaceuticals and insurance. But the CSB -- the independent agency charged with investigating industrial accidents -- says applying PSM to drilling is the proper remedy for a real problem. "High rates of worker injuries and fatalities within this sector suggest that PSM requirements are urgently needed," the agency said in comments sent under the signature of Chairman Rafael Moure-Eraso. So far this year, there have been at least eight fatal oil and gas explosions in the United States. The best-known of them -- a blast at a Chevron well in southwest Pennsylvania -- played into the debate on approving drilling at the Pittsburgh airport. Chevron earned national derision after the February fire for distributing coupons for free pizza to locals. Many residents, though, said they appreciated the gesture. State officials found chaotic management of the site. Chevron had used "no fewer than seven" site managers at the site in the week before the fire, some of whom had "virtually no oil field experience" (EnergyWire, Aug. 8). The Feb. 11 accident was at least the second fatal oil and gas industry explosion of the year. Daniel Rice, 33, was killed in January in Knoxville, Ark., when a truck tank of drilling wastewater exploded. 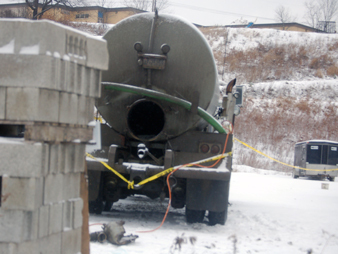 Workers had been thawing valves on the tank with a propane torch. It's not an unusual way to melt the ice on the back of a truck. That's what OSHA inspectors found when they looked into the accident that killed Greg Bish. "I have thawed many of the valves using the torch," David Champion, a co-worker of Bish with 34 years of experience, told an inspector. "We also thaw the frac tanks." Several others said the same thing. In the months before the accident, a Pennsylvania safety consultant had told OSHA it was "common practice." Michael Rubeo of Lancaster Safety Consulting wrote in January 2010 on behalf of a company that used propane torches to thaw frozen lines at production sites. OSHA's response, noting there are no specific federal rules to prevent thawing valves with a propane torch, is part of the agency's investigative file. Since 2009, oil and gas production has had more deaths from fires and explosion than any private industry. Source: Bureau of Labor Statistics, Census of Fatal Occupational Injuries. "That was relative to what we were seeing in our region at that time," Rubeo, whose office is in Wexford, Pa., outside Pittsburgh, said in a recent interview. "You drive two hours north of here and get into the more remote areas, and I'm sure any number of practices like that are still performed." Bish worked for West Penn Energy Services, a 20-year-old company headquartered just outside the small borough of Elderton, Pa., in the thick of the Marcellus Shale boom. West Penn was no rogue operator. The company's safety manager was on the safety committee of the Pennsylvania Independent Oil and Gas Association. The company had a state-certified safety and health program, which allowed it to get discounts on workers' compensation insurance. West Penn's website states, "We are committed to doing things right." Investigators found that while West Penn had a "strong safety program" in terms of written materials, many workers said they weren't trained in the practices listed. West Penn President Michael Zentz did not return phone and email messages. In a statement at the time, the company said, "Our company's foremost priority is ensuring the health and safety of our employees." The West Penn yard, at the intersection of two highways about an hour's drive northwest of Pittsburgh, backed up to a school. Elderton High School (which has since closed) is about 520 feet up a hill from the truck yard. There's a house about 700 feet away. Bish was from Ford City, about 25 minutes away. His mother, Kim Bish, said he took the job to be closer to home after a couple of years traveling with fracking crews. That meant more time to hunt and fish and spend time with his girlfriend, she said in an interview. He also told her his new job was safer. After all, he was driving a "water truck." But the "water" is waste fluid from oil and gas sites. OSHA took samples of the sludge in the bottom of the tank and found a range of "aliphatic hydrocarbons" -- chemical cousins of oil and gas that are prone to explode. "He told me, 'I've got a safe job now, Mom,'" she said. "That haunts me every day."